The surface of the white gold has the subtle glitter of a fine dusting of diamonds due to the precision and density with which these tiny diamonds are set - an effect termed 'micro-set' by David Morris. These earrings, by London jeweller David Morris, unite elegant design with superb gemstones and exacting craftsmanship. Part of the ‘Heritage Collection’ they were inspired by David Morris’s ‘flexi ring’ of the early 1960s, and were designed in 2012 to celebrate the company’s fiftieth anniversary. In addition to the large diamonds spaced down the centre of the earrings, the surface of the white gold glitters subtly with a fine dusting of diamonds. This effect, termed 'micro-set' by David Morris, owes its success to the precision and density with which these tiny diamonds are set. David Morris, founded in 1962, achieved rapid recognition with two Diamonds International Awards in the early 1960s. A different glamour was reflected in the commissions of jewellery for James Bond films. The company remains a family concern and in addition to London now has stores in Moscow, Dubai and Hong Kong. 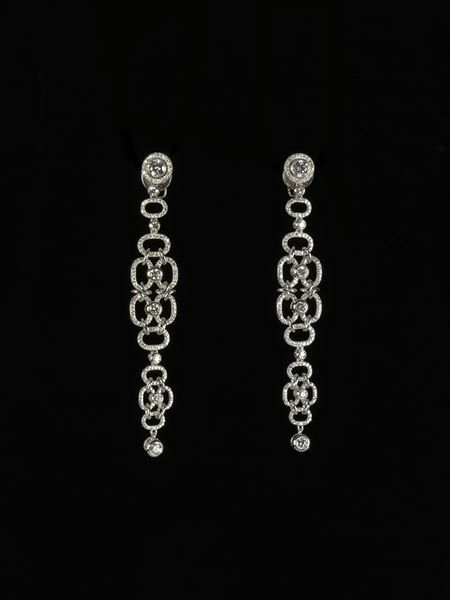 Long flexible earrings comprising a delicate chain of diamond micro-set oval links studded at intervals with larger single diamonds, the largest at the top. 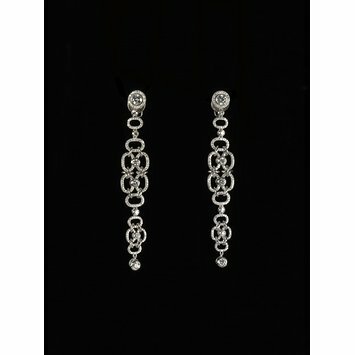 Contrast is introduced by the highly polished white gold links which join the glittering ovals. With posts for pierced ears. David Morris's Heritage Collection was created to celebrate the company's fiftieth anniversary in 2012. It draws its inspiration from the flexi ring of the early 1960s, extending the interconnecting links of this distinctive ring design and applying them to necklace, bracelet and earrings.